Yes, I am back with yet another denim on denim outfit. What can I say, I just love how it looks. I actually got inspo for this outfit from Pinterest because, I'm not going to lie, I would never have thought of pairing this shirt with these jeans by myself. Isn't Pinterest a wonderful place to be when you're bored at midnight? We all love Pinterest. I've also done some major DIY on these jeans - ages ago I ripped holes in the knees. To be honest, I wouldn't have done that if they were my fave jeans and I wore them all the time, but I rarely wear them so why not? Then this morning, I decided to take things one step further and make them into ankle grazers. Yes I know, how very daring of me. On yet another Pinterest rampage I was looking at distressed hem jeans and admiring how awesome they are, so these babies became the test subject to my distressing experiments once again. I have to say, I much prefer how they look now. I was also thinking of dying them grey because I'm kinda over the blue acid wash now. And I think I would wear them loads more if they were grey. 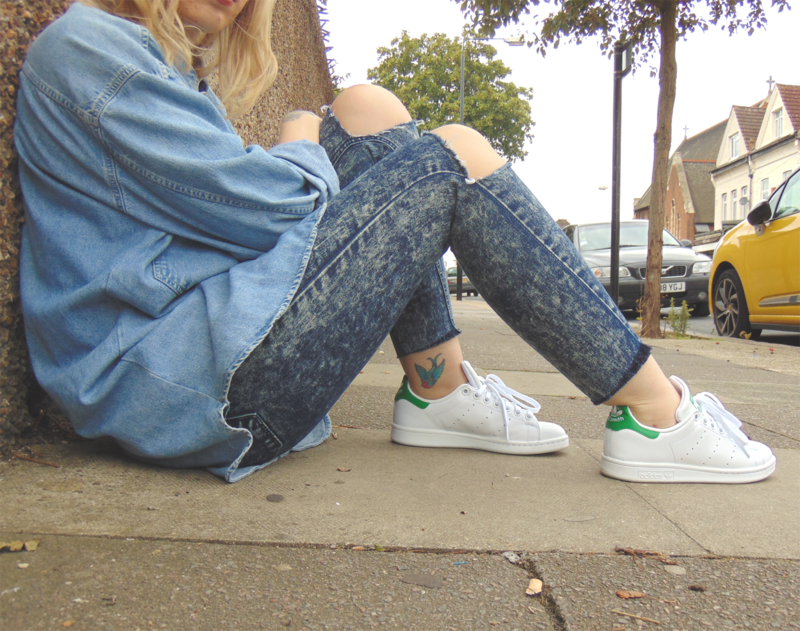 I just bought some distressed denim jeans today and they are marvellous! Can't wait to wear them! Love your cute hair and outfit! Distressed jeans are my fave! Thank you! So cool ! Love your pants ! You always make denim on denim look effortless, I'm super jealous of that fact! 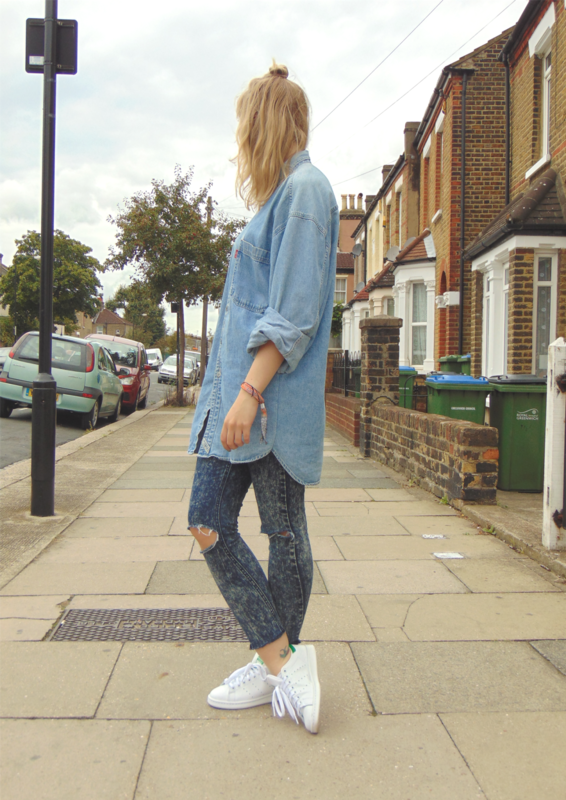 Love the two different denims together in one look! Simple and cool! I love that shirt! You can never have too much denim. This looks great! And I love your hair x. God, I LOVE the look. I've been meaning to rip up some of my old jeans, too. but have never got quite the guts to do it. Fact: I'm (very likely) the clumsiest person in the world. One wrong move and I'll destroy them jeans. I don't know if I should risk it! I always get so scared before I do it as well but they always turn out so well. Just watch some YouTube tutorials and go for it! You'll end up loving them! Your jeans look really cool! I am in love with your shirt! This outfit is so cute!!! 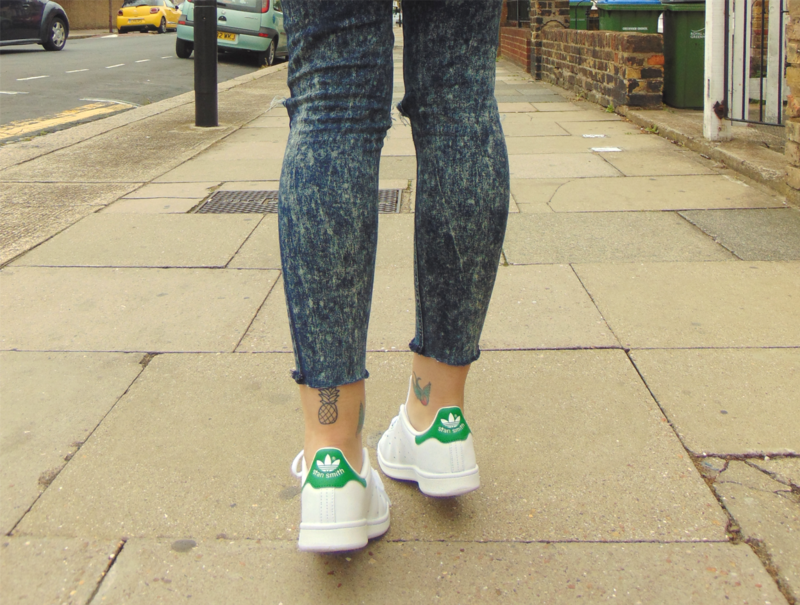 You did a great job on the jeans and the shoes go perfect with it all!!! 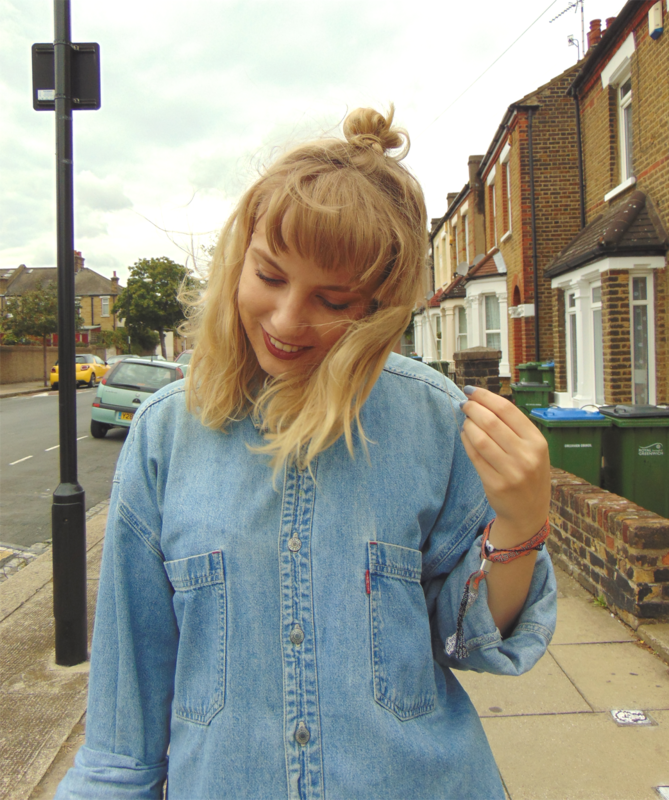 Always love a bit of double denim (a bit too much actually!) And freakin' adore your fringe. It's looking fab!! Loving this look, i'd never think to pair these items together. I'm a little addicted to Pinterest too, I have a board for things I never even knew I was interested in! Always love your outfits, this one is fab and timeless! I love your outfit, Is something I would wear on a casual lunch or see friends to a movie. I love this look! 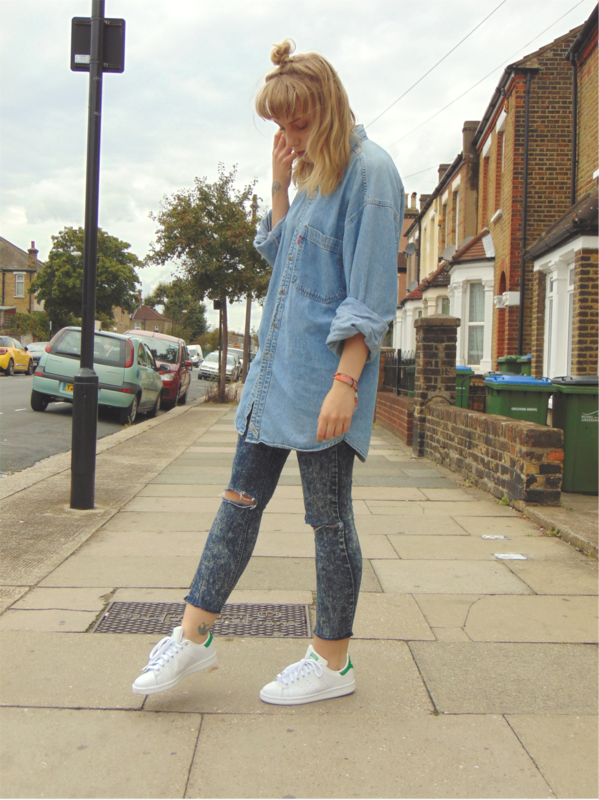 I'm always far too intimidated to try denim-on-denim but I think I might have to now! Loving this outfit and hairstyle! gorgeous! so cool and funky. love your style! You are rockin those jeans! And nice tats! Love your style, you rock every outfit! Still loving those shoes and love this combination with the shirt. I need that shirt in my life and those diy jeans are fab! Oh, and your pineapple tattoo is amazing! I did not know you had that! 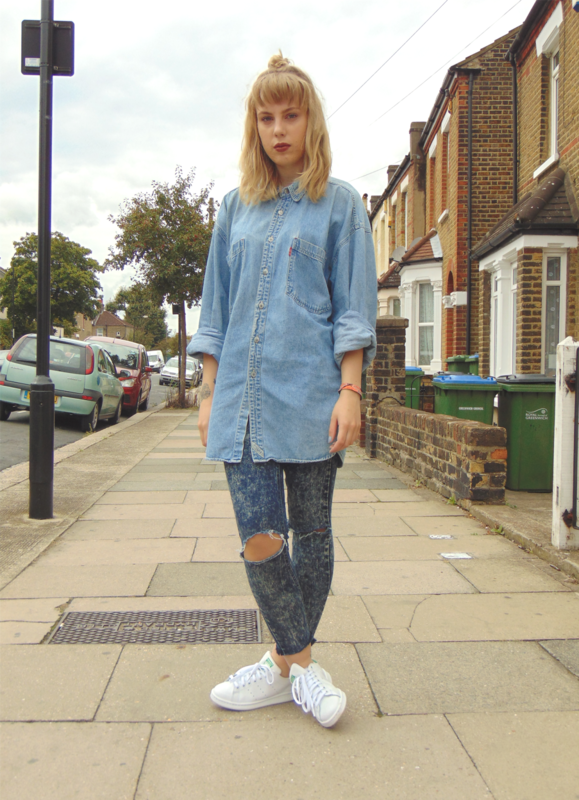 You can pull off double-denim so well! I'd love to know how you turned your jeans into ankle grazers - I've wanted to do the same to mine but am terrified of doing it wrong. Yours have turned out perfect! Absolutely love the denim shirt!! 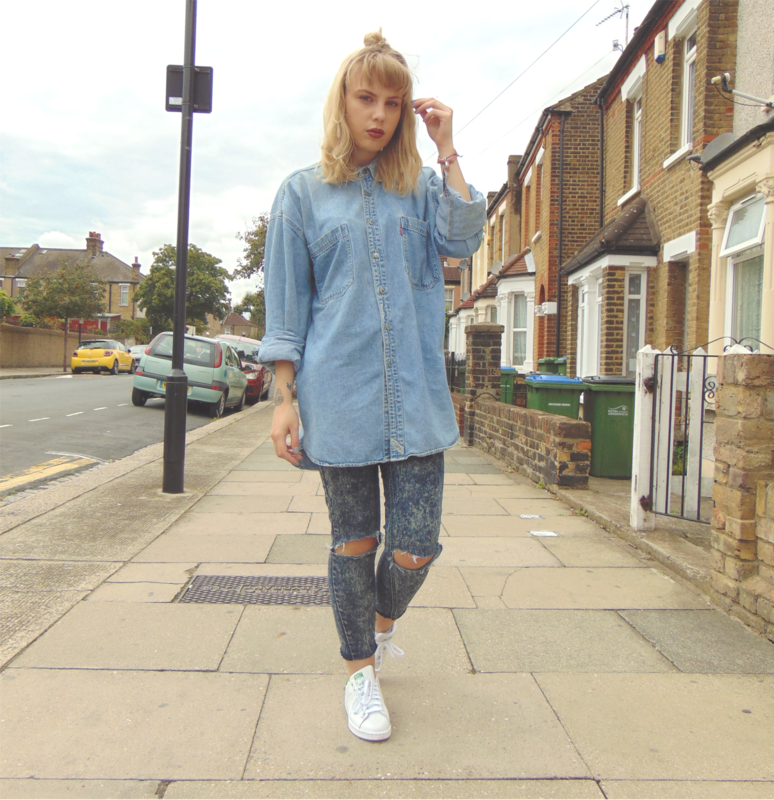 i've been meaning to try a double denim look myself, love how you styled it! Love this outfit, I have been hunting on a simple shirt like this for months!